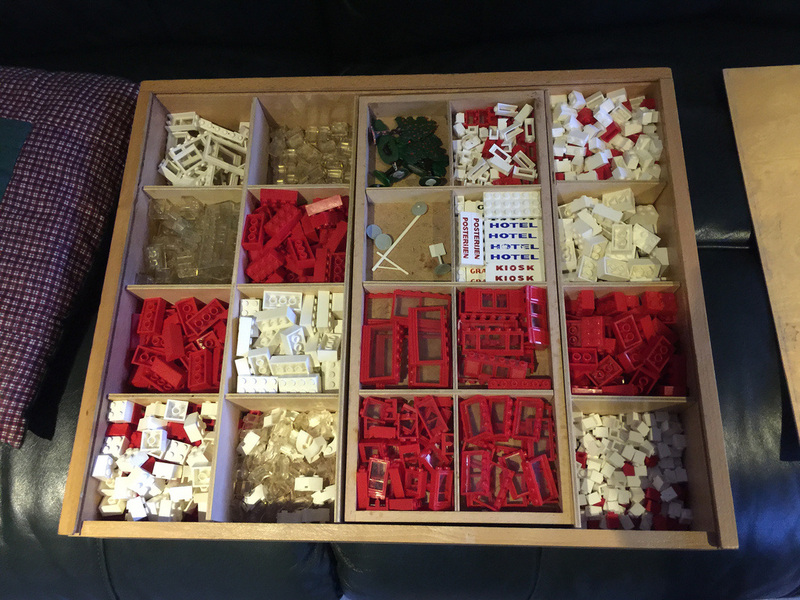 A few days ago I posted about some vintage LEGO I was able to sort and research. It was pretty awesome to experience the same sets my parents would have enjoyed as children. As you may already know, much of the parts I had in front of me were most likely from a very old Town Plan theme from the late 1950s. 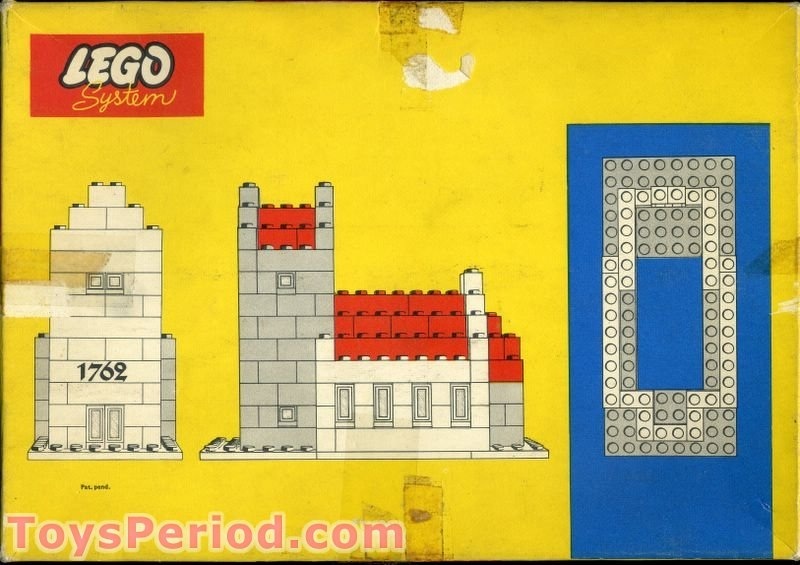 According to Gary Istok on this page from Eurobricks, these sets were considered the first model sets to be released under the LEGO System i Leg or System of Play, the name that eventually became the sets we enjoy today. 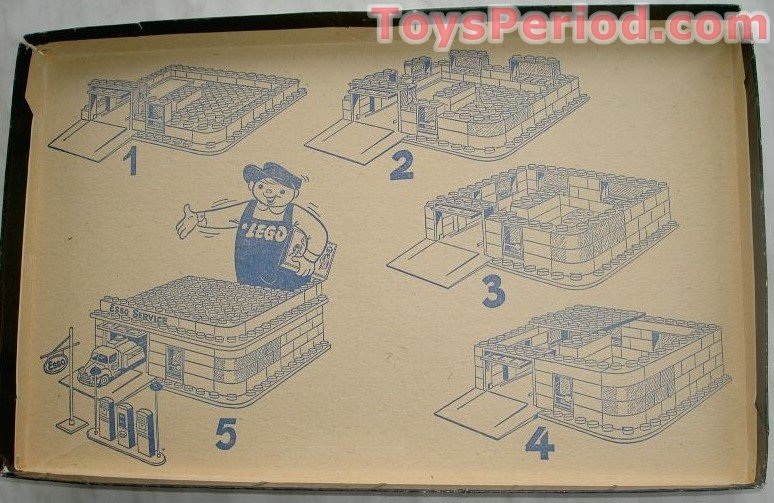 The Town Plan sets were most likely the beginnings of the current City theme, and these were very special indeed. It seems that back in the beginning, LEGO didn’t mind creating sets on religious themes. 1309 Church looks to be the only one, however. After looking at the parts and set lists with Town Plan, I’m not sure if these were strictly 5 separate sets, or a mixture of a few little ones that just happened to create the 5 buildings, but it’s still a great experience! For the most part, this review will be focusing on all of the buildings together, as there is interesting parts common to all. All of these sets use parts made from the cellulose acetate plastic, so it has a tendency to warp. 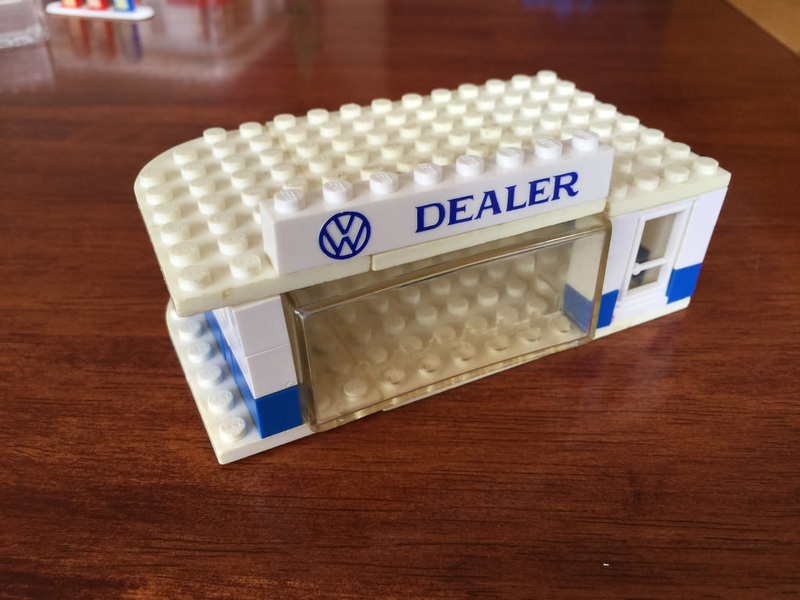 Most of the parts were still usable, except for the large box window in the Auto Showroom set. That part had warped so much, I wasn’t able to connect many parts to it at all. There’s some great macaroni bricks (the corner bricks), but not many colours. Colours in vintage LEGO is quite interesting, and still causes me to wonder exactly when this collection is from. 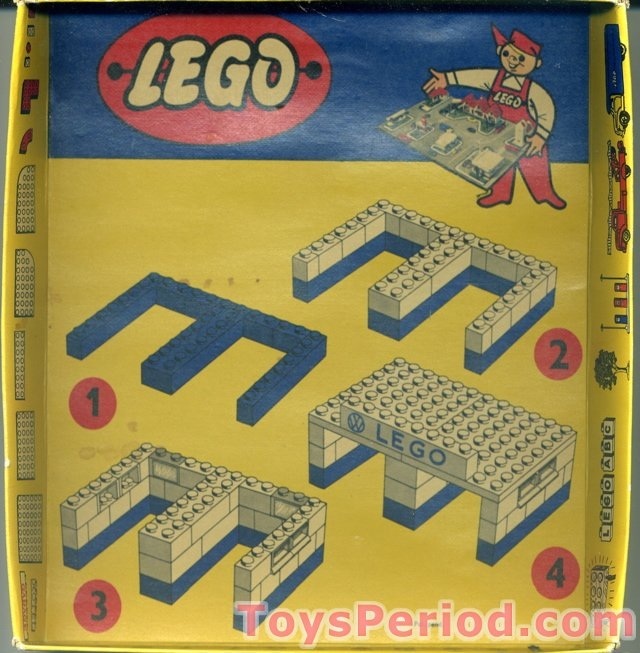 In the early 1950s, LEGO had the Automatic Binding Bricks. These were before the System i Leg product. According to this post on Eurobricks from Gary Istok, the earliest Automatic Binding Bricks had 5 colours (red, white, blue, yellow and green). In 1951, blue was removed, and by 1954, it was just red and white. The sets in front of me are mostly red and white, but the blue caught me off guard. 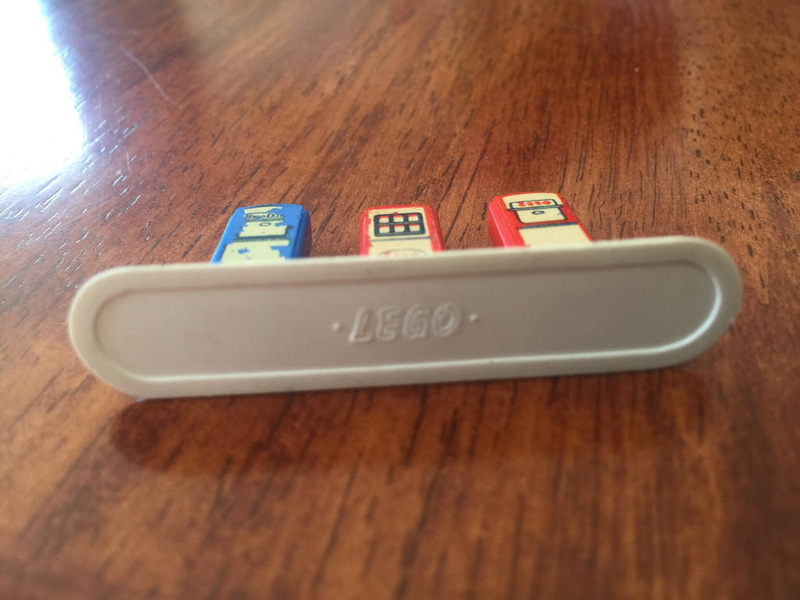 These may have been the first colours used in the LEGO System i Leg. I’d have to do some more reading to find out more! 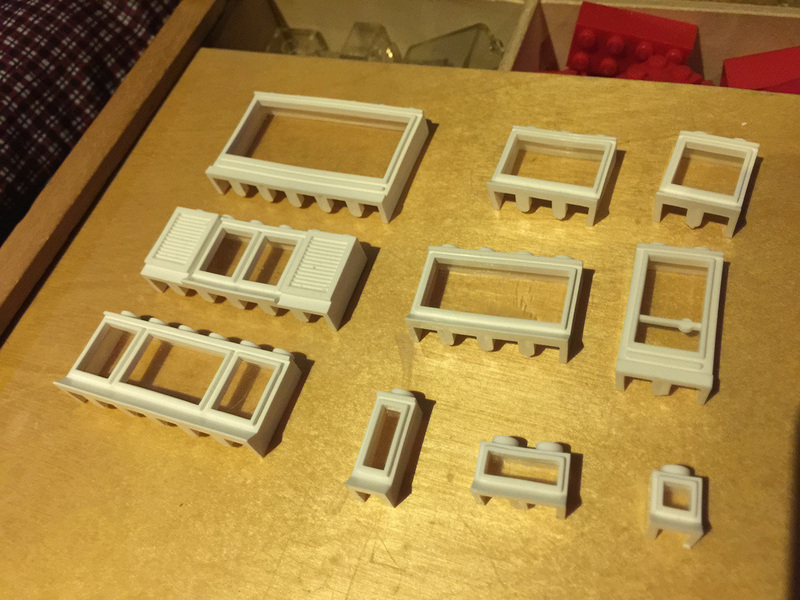 Of all the parts in these sets, the most interesting are the named beams, and the parts without studs – the parts that look the least like LEGO! These are the trees, signs and petrol pumps. Let’s have a look at the named beams first. These beams were first used in the Town Plan sets, and were really versatile, as they could be used on any build, and there were plenty of them. An endless variety of words in many languages were printed on white 1×6 and 1×8 bricks. 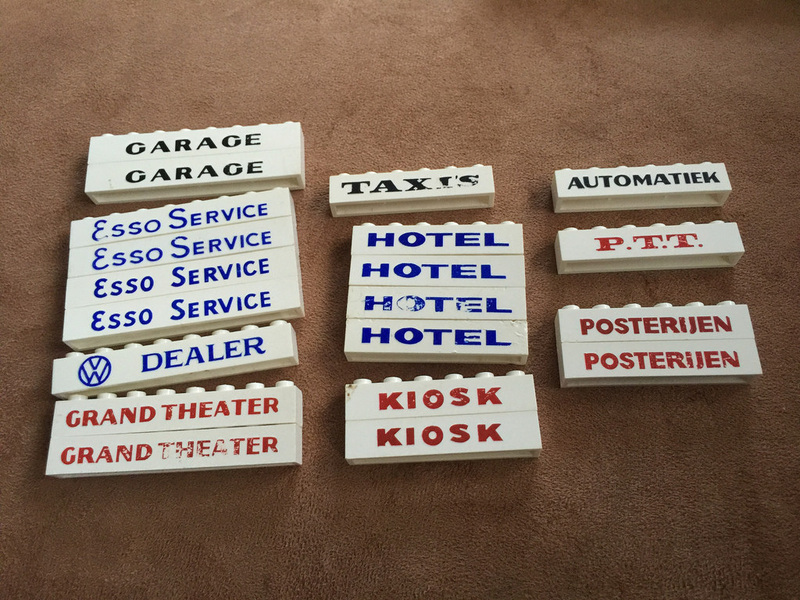 Popular words were GARAGE, KIOSK, HOTEL, RESTAURANT and ESSO SERVICE. In the late 1950s, the bricks were of different colours. A very clear difference with these bricks was underneath. These bricks have been around since before the tube locking mechanism was added to the long single stud wide bricks, so these beams had a large opening on the base, with the brick only being held on by the outside walls. Because of this, they’re pretty loose. For more information on the named beams, check out this Eurobricks link. 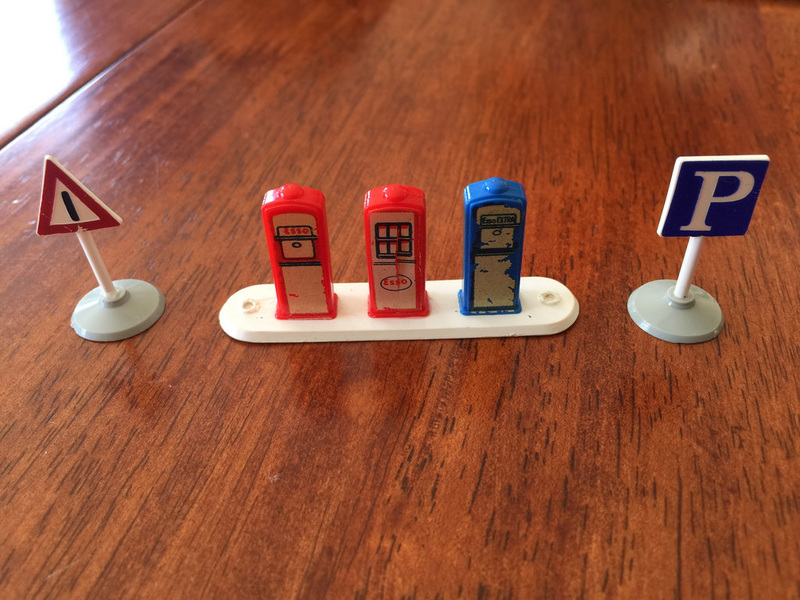 These certainly don’t look like any LEGO product we know today, but sure enough, they are! 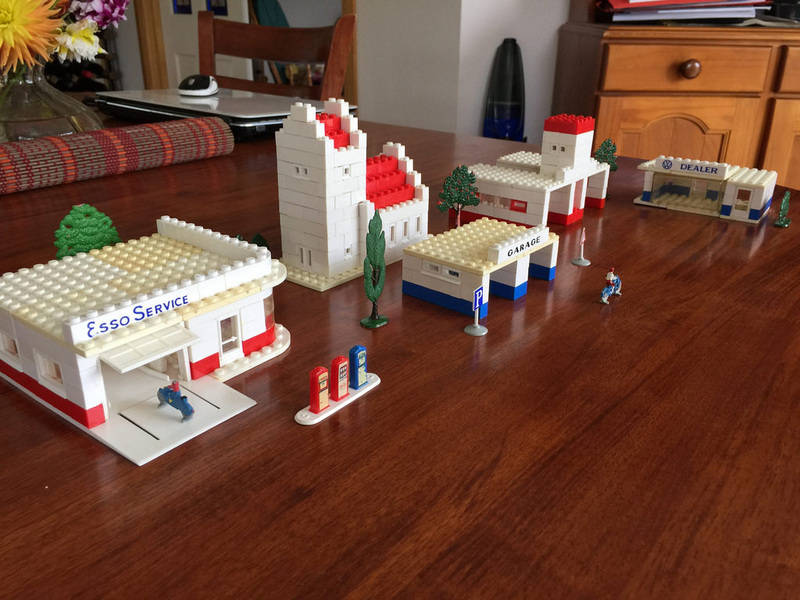 According to isodomos.com, LEGO painted trees were produced between the 1950s and early 1970s. The ones I had in front of me were the ones with the flat bases, and were meant to be used with the flat town plan boards, instead of baseplates or bricks. 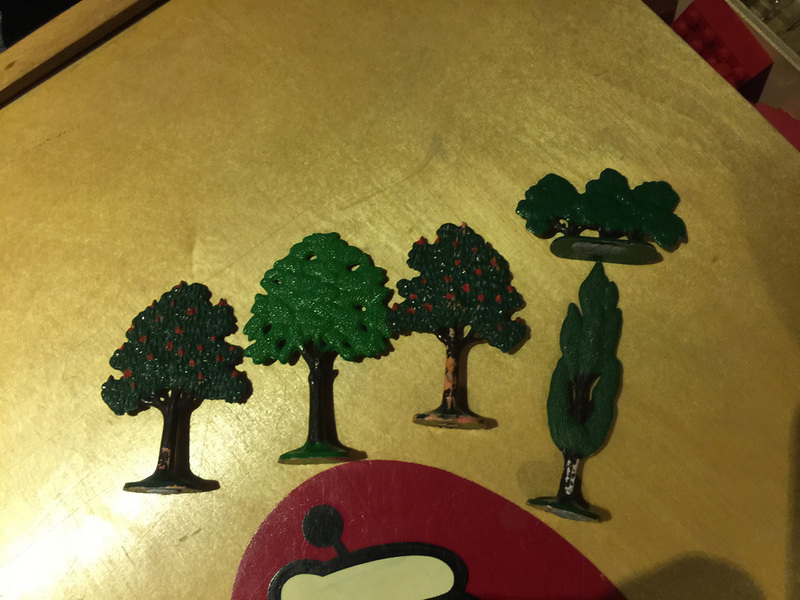 Check the site for more pictures, as well as the next few iterations of LEGO trees, including the ones we know today. They’re brilliant! I vaguely remember these windows when I was a kid, but haven’t seen them for a while. There are a few things to note with these windows. Firstly, the different sizes of them! There are different heights and widths, ranging between 1 to 3 bricks high, and then there are 6 studs wide, 4, 3, 2 and even 1 stud wide, the same size as the Erling brick we know today. I also like the little angled window sill at the base of each window, with one type even having shutters on the outside. 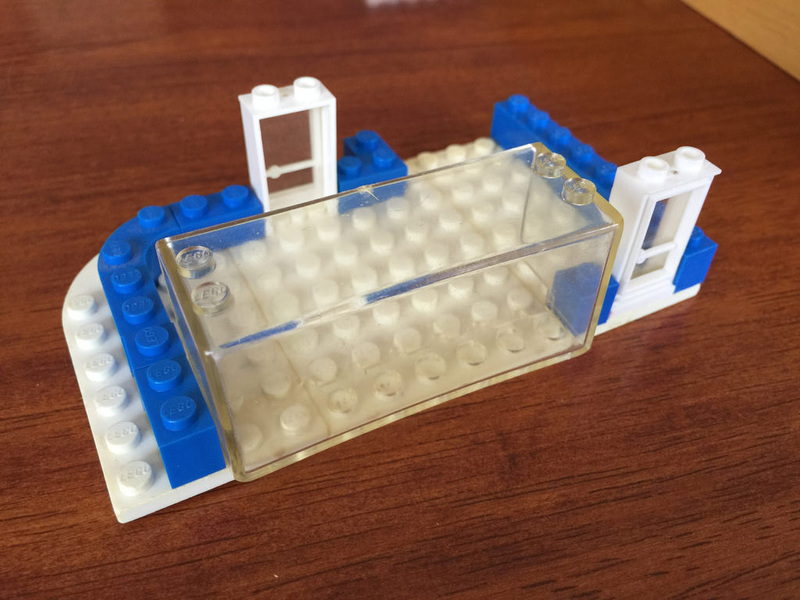 The bases of the windows aren’t as strong as the ones today, mainly due to being a different plastic, but also the base isn’t a solid mould – it has teeth that fit between the studs. According to some searches on the internet, these pumps were slightly different for each country released. The one in front of me appears to be missing the light posts on the outsides. The pumps themselves are in pretty good condition, and still have the LEGO logo clearly visible on the underside. Lastly, I want to talk quickly about the plates. 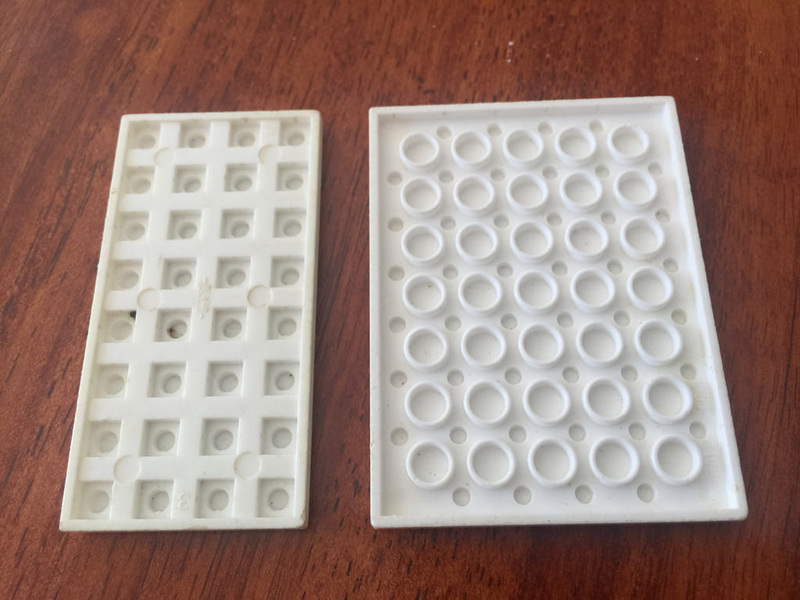 The main, obvious difference with these plates is the pattern on the underside. This pattern of squares on the underside is known as a waffle bottom, seen on the left of the image below. These would have been quite tight back in the day, but the years haven’t been all that great to these old CA plastic parts, and they’ve warped and discolored quite dramatically. 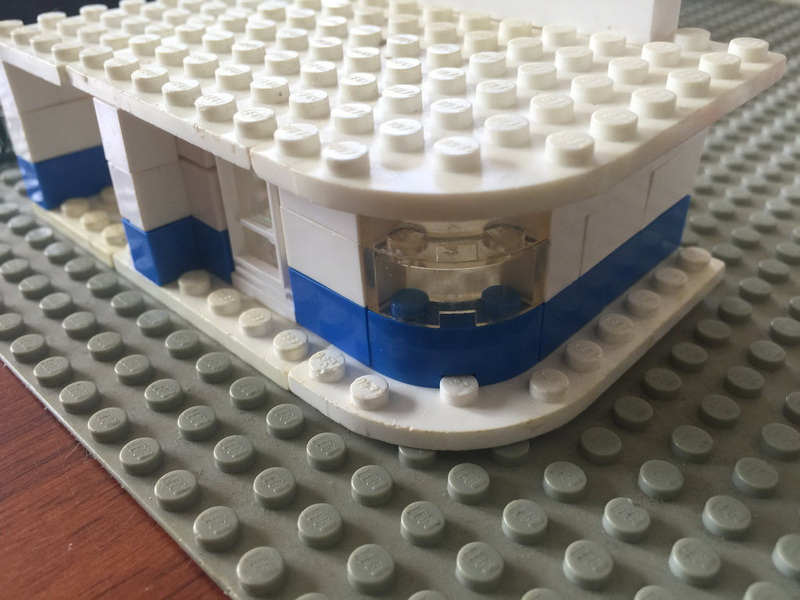 The other interesting detail to note is the rounded corner plates don’t have the stud holes in the corners, so while they look great on the exterior of a building, they can’t be used on bigger plates like the blue piece in the photo below can. On to the build! The hardest part of these builds was really the fact that the parts had warped, so it was tough to connect them. On the other side of the spectrum, some had warped so they were extremely loose. This was definitely the case with the church and fire station, where the church’s steeple was about to fall over by itself! The other tricky part was the size of the instructions. For these boxes, the instructions were printed on the underside of the lid. This meant that there were only around 5 steps for each building, and sometimes, no colour. 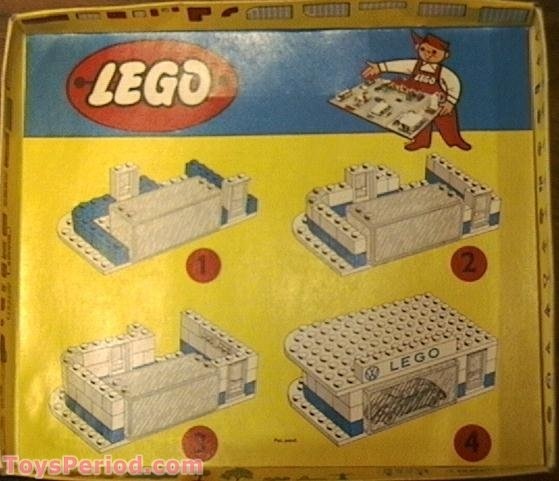 Obviously kids back in the day were very adept at reading LEGO instructions! Click each image to get to the website I used for the instructions and you’ll see what I mean. This was the first building I put together. 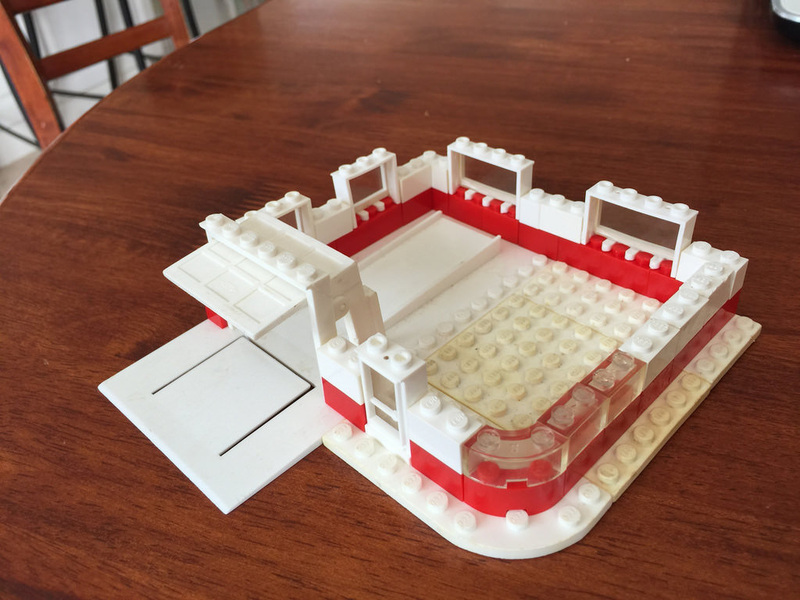 The first step was pretty simple, apart from figuring out what bricks to use, until after building it in white, I remembered it was meant to be red! I swapped them out and kept going. 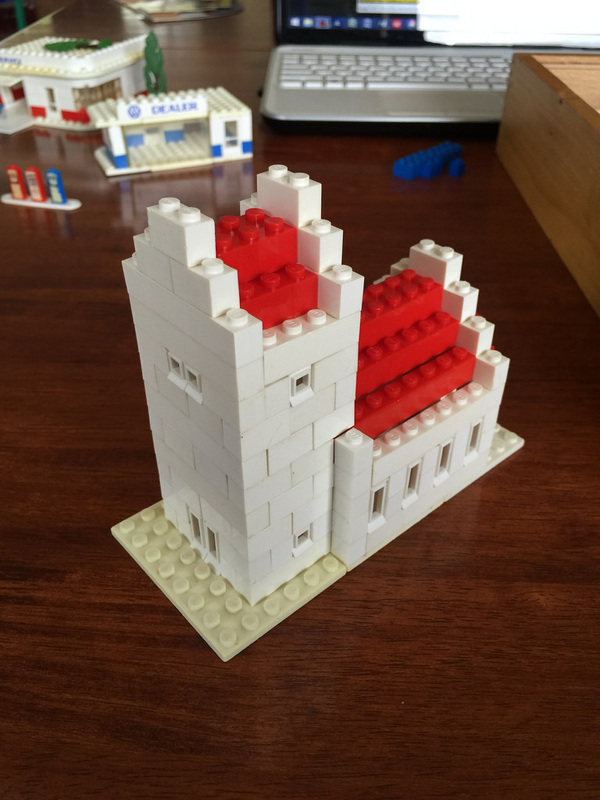 The base plates and the roof were tricky to get right, but I got there in the end. 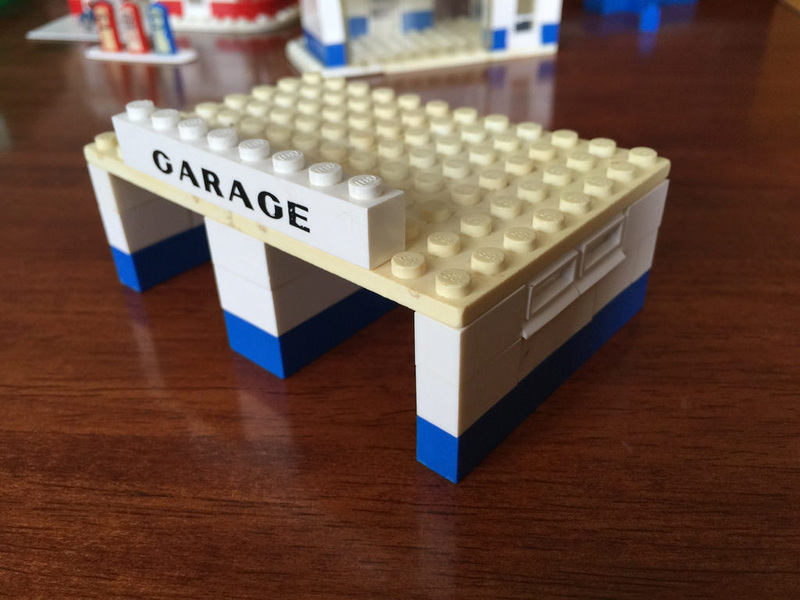 I found that the garage door didn’t stay standing in the build unless I had it open and resting on the weights, and after adding another brick, it would fall over. After adding the roof, it gave it much more strength, and I was pleased to see the garage door mechanism still worked. When a car is resting on the flap at the front, the door would automatically open. The main problem with this set was the huge warp in the showroom window. The other side of the building didn’t appear to connect to the rest as well. It may have been the version of the instructions I was looking at, but I couldn’t seem to get that right. Once the roof snapped on, it seemed to hold everything in place. There was also a massive hole in the back of the building, which was a little odd! 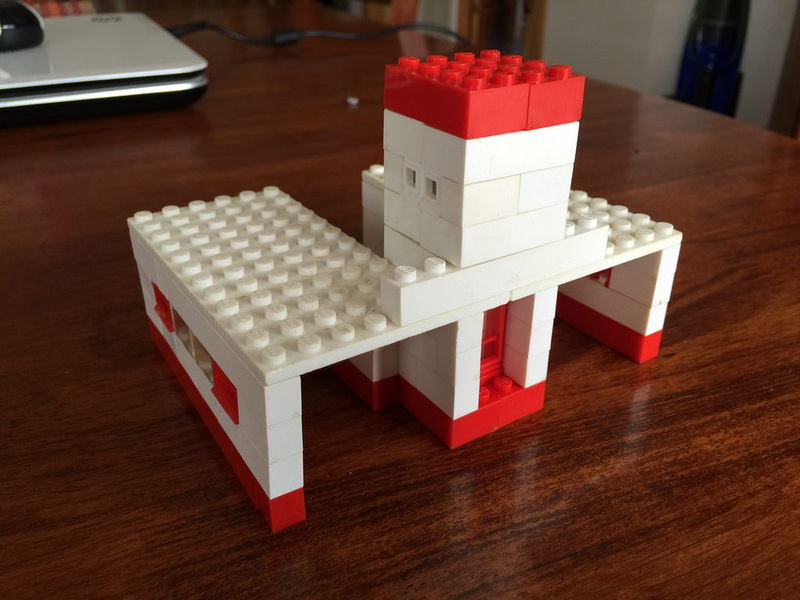 This build is very simple, with no base plate used, and a simple M shape as the building. No real problems here, except the bricks didn’t hold together very well due to warping. It was the first building I built that used the 1×2 windows. Again, this one was pretty straight forward, but I did run out of white Single stud wide bricks, so I kind of cheated and used the named beams instead. The base of the building was very loose, so moving it tended to dislodge some bricks. 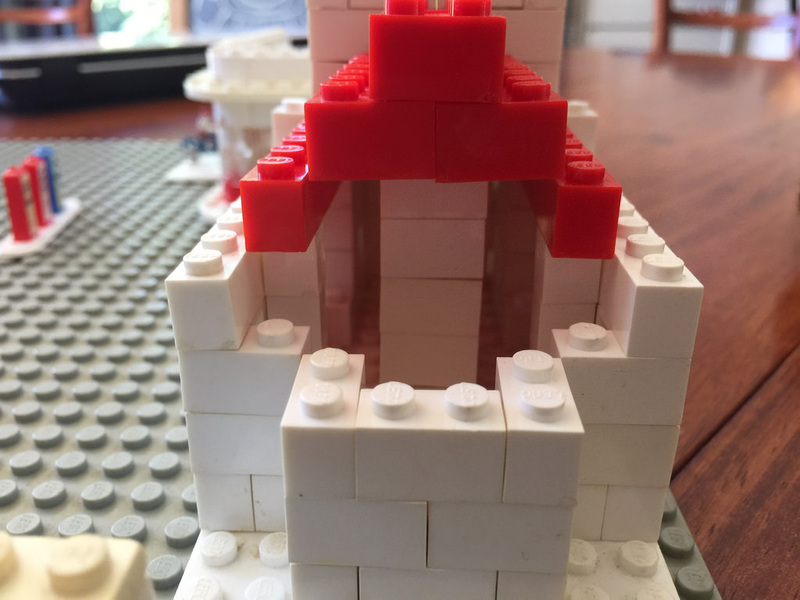 The church was the hardest to build by far. I couldn’t find a set of instructions, so all I had to go on were photos and drawings. It meant I couldn’t get the roof accurate, so I cheated by adding a large central column and 2 smaller ones to hold the roof up. 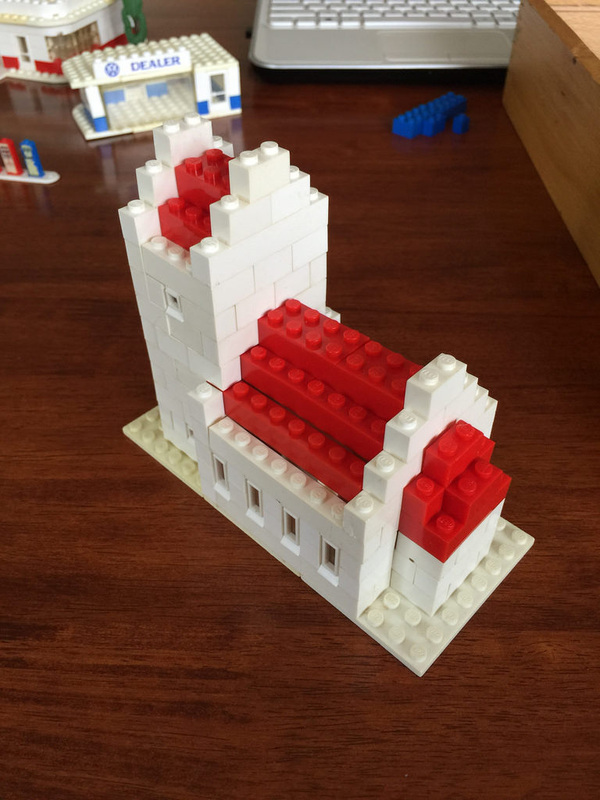 The steeple is extremely loose, due to the warping of the bricks, but it still looks really effective. It’s a shame I have to take it down before I leave! All in all, I was really excited to get to build these models. It was great to experience raw LEGO, the way my parents would have enjoyed it as children. Sure, the models these days are much more detailed and have specialist parts, but the simplicity and at the same time, complexity of these builds is really special. It would be great to have the original base board to display it on. If I ever get a chance to own one of these sets, I’d definitely look at purchasing the base board and completing the theme in all it’s glory. No rating for this one, just nostalgia and seeing family experience the joy in seeing these sets used again, in all their original builds. I’ve had a great week! Next week I’ll get back into the reviews of the modern seats with 21301: Birds. If you’ve had any experience with these sets, I’d love to get in contact and see if I got my details right, or if I was way off the mark! Please feel free to get in contact with me using the Contact page, or by leaving a comment below. 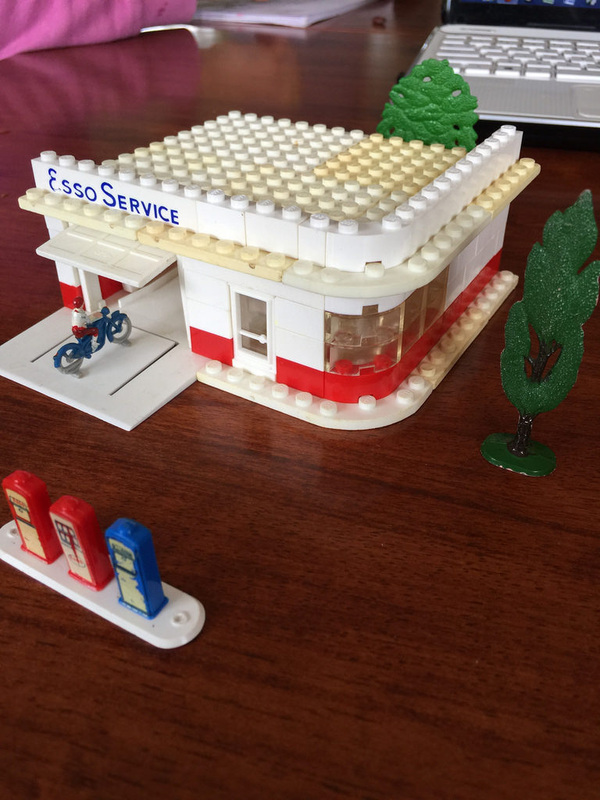 I have a friend that received a The Esso station and church when she was a little girl in Denmark. She was really amazed with the clear lighted brick for the church. Oh lovely! Does she still have the original packaging? She does not still have it. She was just reminiscing about childhood and we were looking for info.